When I started writing this blog post nine days ago, I didn’t realise that I had so much to say about kanzashi. It’s taken me this long to gather all the information that I wanted to share and try out my kanzashi flower makers! Kanzashi refers to the Japanese style of making fabric flowers. 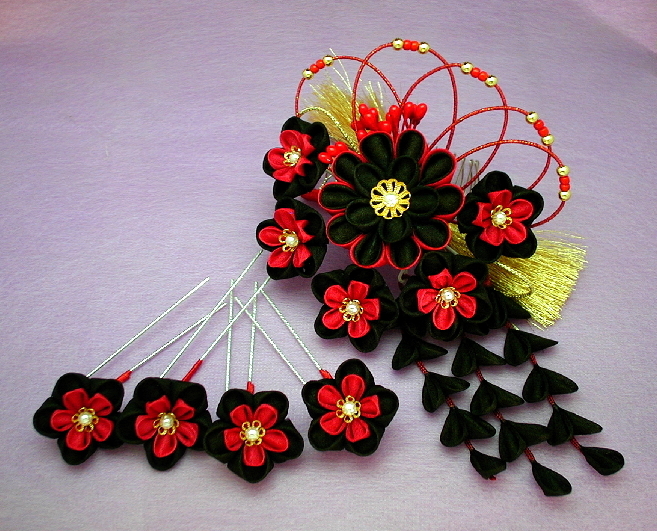 There are two styles of Kanzashi making, traditional and contemporary. Traditional tsumami kanzashi are decorative hair ornaments, usually made with tiny squares of silk and a thick rice glue. Large pieces of silk are hand dyed and starched, then cut into tiny squares, folded with tweezers and glued together to make decorative hair pieces. It’s quite amazing to watch experienced kanzashi makers at work, the speed and efficiency with which they work is dazzling. There are artisans still making tsumami kanzashi in the traditional way but creating contemporary style pieces. Kuniko Kanawa of Atelier Kanawa is one such artist. Make sure to check out her Youtube videos for inspiration. Especially interesting are her custom order records and a three part video in which she describes how traditional petals are made. Unfortunately the closeups won’t show you how they are made but the documentary I’ve included at the beginning of this post will show you much more clearly. 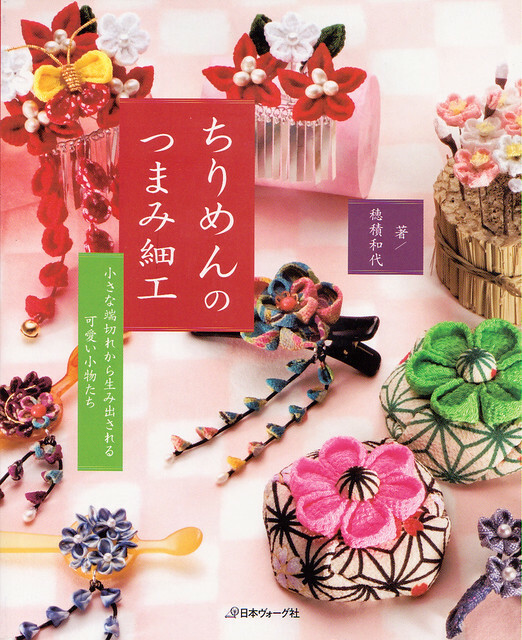 A few years ago I bought these two books on making Kanzashi in the traditional way. They’re in Japanese but the photographs are quite interesting and easy to follow. 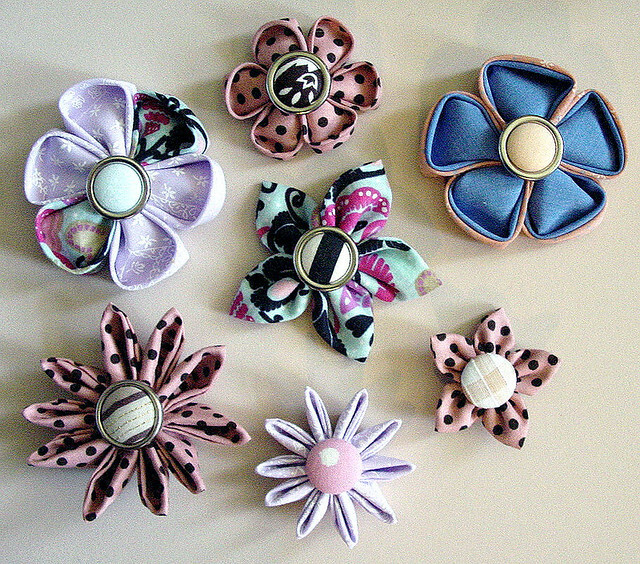 The other style of kanzashi that are popular today are the sewn style. In order to make the art form more accessible to today’s crafters, a technique using larger squares of silk or cotton has been developed. Whilst some people argue that this development detracts from the importance of traditional tsumami kanzashi, I disagree. I see it much as the way teneriffe lace developed into flower looming. A traditional, time consuming technique being developed for modern crafts people and materials. I couldn’t say who pioneered this technique as it’s been passed around on the internet for at least ten years or so, with each crafter adding their own twists and additional techniques along the way. Sewn kanzashi tend to be much simpler than most traditional pieces, however a larger number of folds have been developed. Whilst there are only two folds used in traditional kanzashi, I have found at least five styles of petal making in sewn kanzashi. These videos show how to make four different styles of petals without the Clover tool. 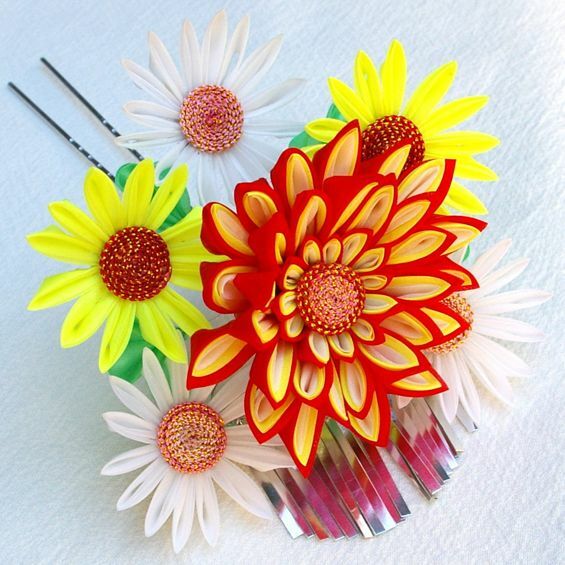 Kanzashi-Making, by Sister Diane from Diane Gilleland on Vimeo. And now to the point of this post! In April Sortahubby gave me a set of Clover Kanzashi flower makers. As most stitchers would know, Clover is a Japanese company that makes all sorts of needlework gadgets and tools. Some of them are necessary items like crochet hooks, pins and fabric pens, while others are cool but not essential items like their quick yo-yo makers (which I love). The Clover kanzashi flower makers. At the time of writing this article, there are six different Clover kanzashi flower makers. They make three different styles of petals in two sizes. I have never made kanzashi by hand before so I can’t compare these with making them without a flower maker, however using these has inspired me to try all of the tutorials I have shown you above and I’ll be purchasing the Kanzashi in Bloom book as soon as I can. I used medium weight cotton to make my flowers. I didn’t starch them because most of the fabrics were already quite crisp. Here are the very first flowers that I made. I found the kanzashi flower makers very easy to understand and use. The whole process was quite enjoyable. The bonuses of using the flower makers were twofold. I didn’t have to measure and cut the fabric beforehand, which can be quite difficult when you have a two year old son running around! It also made it easy to use any odd shaped scraps of fabric I had lying around. The other benefit is that you don’t have to make any folds, other than to fold your fabric scrap in half to begin with. If you have trouble with fine motor skills, or are just plain clumsy, you can still use these flower makers to make many petals that are exactly the same. The other problem, which may not end up being a problem at all, is the thin piece of plastic that holds the two halves of the template together. It seems quite strong but I would be concerned about how long it will last. Since I did really enjoy using them, I might have an update on that for you in the future. My flowers are very simple, using just one template each. For the round petal flower on the top right, I folded two pieces of fabric and placed them on top of each other before closing the flower maker to create petals with contrast coloured centres. You can also make rings with different numbers of petals and stack them up, use four to make a butterfly, two for a heart or bow and so forth. You can also combine the different templates to make more styles of flowers. So what do you think? Will you have a go at making kanzashi? 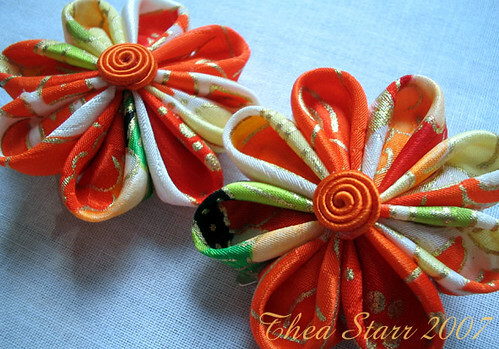 orange kanzashi, originally uploaded by thea superstarr. I’ve been admiring these little fabric flowers on Craftster and people’s blogs for a couple of months now, and was really happy to find this blog post about them. Edited to add: A series of in depth tutorials. Click the download link for each one to save them.